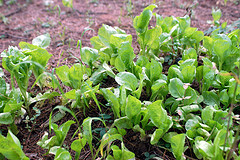 Baby greens coming up late in a shady garden. Yay! I need to learn about which microcliimates around here wil produce what. I would like to have greens and tomatoes all year long. Should be possible by controlling microclimates. I should take a few of the test gardens and plant a couple new rows each month so I can really track what the yield is at different months. You are currently browsing the News and thoughts from the Bosque Village weblog archives for December, 2006. Entries (RSS) and Comments (RSS). 18 queries. 0.131 seconds.